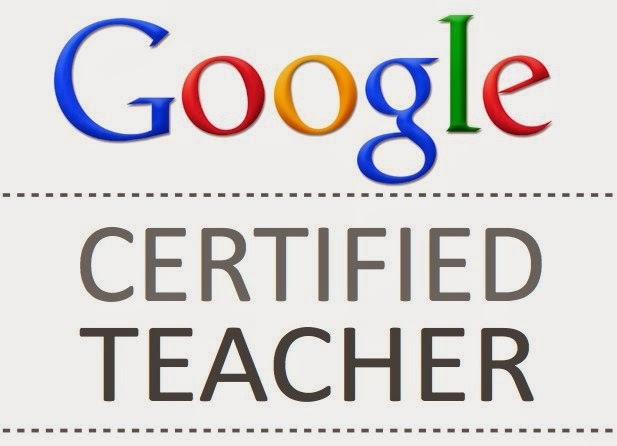 Here's a quick tip for teachers who teach the same content in multiple periods. In a few quick steps, you can have students in separate periods take the same form, with all the responses in the same document but each class will have its own sheet. This tip is especially helpful if you're using a script like Flubaroo for grading, and want to e-mail grades separately for each class. 1. Create your Form. 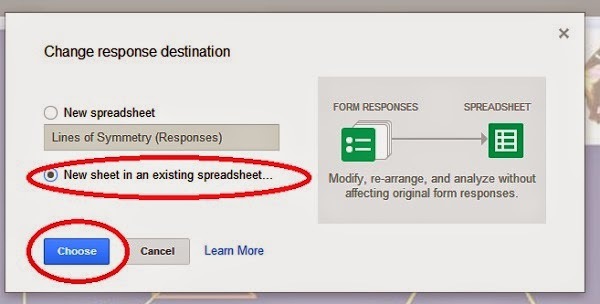 If you have the setting "Always Make a New Spreadsheet", then in your Google Drive there will already be a Spreadsheet with the same name as your Form (Responses). If not, click Send Form, e-mail the Form to your first class, and create a new Spreadsheet. 2. Make a copy of the Form by going to File -> Make a Copy. Rename your copy with the Class Period. 3. When the copy opens, go to Responses -> Change Response Destination. 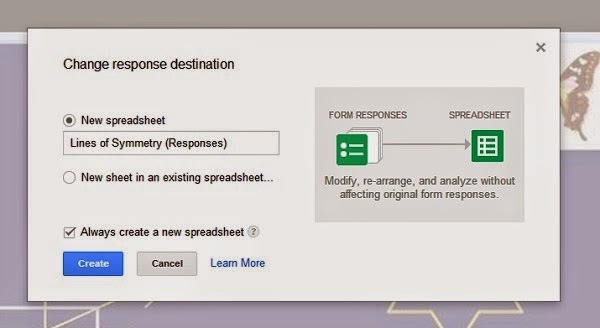 Then select New sheet in existing spreadsheet, followed by Choose. 4. 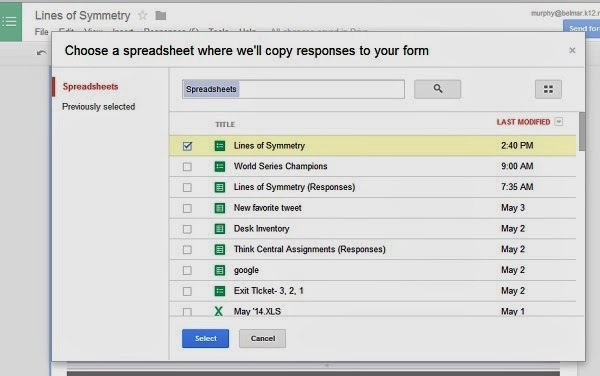 Select the original spreadsheet. 6. Repeat steps 2-5 for as many classes as needed. Enjoy! If you have any questions, leave a comment! Until next time! Thank you for sharing this. I have one question, i need to use one form and linked to different sheet. I created based on the above instruction, the main problem is when i am creating different sheet, the respond in first sheet is duplicated to others, is there a way to avoid this. I have a form and it will be filled on daily basis , so do i have any option that a new spreadsheet need to be created daily(based on date) .